17 years on the job and looking forward to another 18. At Bancroft and Sons, we pride ourselves on focusing on the essential task of mail hauling through CDL driver and team driving jobs and positions. If you are looking to work for a great trucking company that provides excellent benefits and a great work atmosphere. Bancroft and Sons offers OTR Truck Driving Jobs in the Dallas, Fort Worth and Arlington TX areas. If you are interested in joining the Bancroft and Sons family visit www.bancroftandsons.com or contact us at (972) 790-3777 to get more information. Visit Bancroft & Sons Transportation's profile on Pinterest. Bancroft and Sons Transportation, LLC is a Federal Motor Carrier providing service from coast to coast in the United States. Family owned and operated since 1969, Bancroft and Sons continues to grow and prosper each year. Started in 1969 with only one truck, Bancroft and Sons has grown to a fleet of 175+ late model trucks and over 300 happy employees. Bancroft and Sons is always looking to add great CDL drivers to their growing family. Drivers have great OTR truck driving job with set schedules allowing more time with your family. By joining the Bancroft and Sons Transportation Team drivers will receive Medical Insurance, Dental Insurance, Vision, Ten Paid Holidays per year and 401k matching opportunities. Clients can always expect a trucking company that offers dedicated and emergency expedited freight service gives you access to team drivers who understand that on time service is our business. New equipment with an average age of 12 months in service – ensure true expedited service with minimal breakdown. Our trailer fleet is testing and fitting the latest aerodynamic devices to meet California regulatory requirements. Our team trucks feature interactive computer systems that utilize cell, wireless or satellite signals. The systems are capable of receiving live two-way messaging, as well as supplying turn-by-turn directions. Our customer service staff can meet your needs with custom-designed reports, tailored to fit any time window from hourly to year-to-date. Our communication systems cover the customer, the office and the drivers, allowing real-time route changes, should the need arise. Throughout our history, Bancroft and Sons Transportation, LLC has focused on safety and safety technology. We're committed to being at the forefront of safety compliance, using leading experts and comprehensive training to help ensure all drivers and staff is well prepared. As always, our trucks include the latest safety innovations, including up-to-date transmission technology, traction and stability control. Onboard communication systems feature text-to-speech capabilities to keep our drivers focused on the road ahead. You can trust your freight to one of the safest carriers in the business. 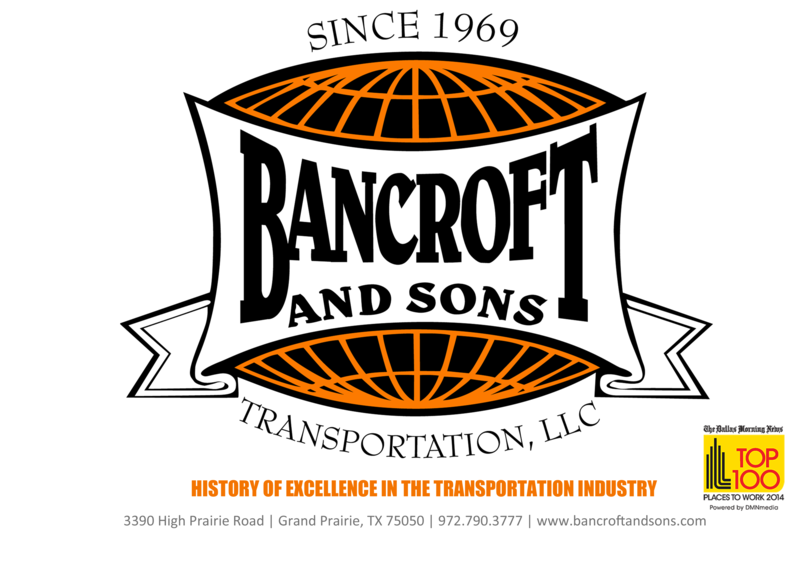 Bancroft and Sons Transportation is located at 3390 High Prairie Road in Grand Prairie, TX 75050.